Mthombothi Studios is named after the Mthombothi tree. 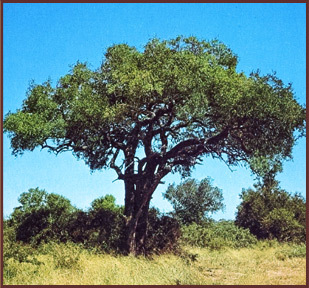 The Mthombothi tree is a medium sized, deciduous tree, growing to a height of approximately 10 meters. It has a fairly straight stem with a fairly round crown. The roots, bark and sap are used for medicinal purposes. A case is recorded where a ranger in the Kruger National Park developed a severe toothache while out on patrol. His partner put a drop of Mthombothi latex in the cavity of the tooth and the pain subsided. The wood was traditionally used to build the stockades around the homesteads to keep wild animals out. Most homesteads now no longer have these stockades, since very few wild animals roam about these days. The Iziqu necklace, signifying bravery in a warrior, was carved from hardwoods such as Mthombothi. It is reddish brown, with lighter blotches that shimmer brightly in the sunlight when carved. The smallish leaves turn bright yellow in autumn. The seeds are often infested with the larvae of a small moth, which cause the seeds to "jump up" when they flex their bodies. Children therefore collect the seeds for fun.